Las Vegas is world-renowned for casino gaming and one of its more recognized casinos is The Bellagio. Aside from being the setting for the famous “Oceans Eleven” film franchise, everything is grand in The Bellagio. When it comes to offerings, there is no shortage at The Bellagio. With over 2,000 gaming machines to choose from along with nearly 200 table and poker games, players also have options that include Keno, Race Book and Sports Book. Created by Steve Wynn and his Mirage Resorts, The Bellagio was designed with the vision to tantalize the senses. Drawing inspiration from the beauty of Lake Como and the village of Bellagio, all details in the hotel and casino tie in with this theme. The site includes a high-end mall, a wealth of restaurants run by the best chefs the world has to offer and luxurious spa and wellness amenities. Its main feature would be its multi-thousand-hotel room and massive gaming floor. According to its site, The Bellagio is “home to the most dynamic and exciting slot action in Las Vegas.” The casino boasts over 2,300 gaming machine that also includes progressive games that can make you a multi-millionaire instantly! Aside from individual machine gaming, the hotel and casino also host The Bellagio Slot Tournaments that serves up fun and entertainment for not only the participants but the audience who sits in and soak up the games. Prizes for the tournaments include massive take-home payouts range from $100,000 to a whopping $2 million. As an additional convenience for its gamers, if there’s a slot machine you’d like to try out, you can head over to The Bellagio website and make use of the Game Finder. Simply input the game you’re looking for and quickly find out about it. The site also lists new machines as well as details that will give you all the info you require. 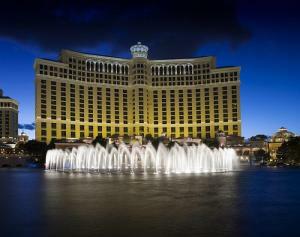 Based on assessment and feedback, The Bellagio is said to offer some of the most exciting action around. Usually The Bellagio attracts a lot of newbie gamers and tourists who are looking to try their luck in the famous Las Vegas hotel. Without the need for prior understanding or playing skill, the slots prove to be some of the most popular activities within The Bellagio. Some reviews peg the hotel to offer frequent jackpots with a high percentage of payback to players over the years. Often described as “an impressive hotel” then moment you enter, you’ll feel transported. From a welcoming water show at the front of the beautifully landscaped and designed structure, you’ll have to stop and take in all that The Bellagio has to offer. We recommend The Bellagio as a one of the top casinos to play slots. Enjoy the atmosphere, aesthetics as well as all that the hotel and casino have to offer in entertainment.